With the prevalence of deficiency in residential units and urban sprawl issues in Swedish metropolises, both in Gothenburg and in Stockholm, the PhD project is motivated to finding strategies to counteract these problems by looking into the planning systems. The project compares the planning systems in Sweden and Japan, comparing the ‘Designed-form based’ planning system working with designs of typologies and detail plans, and the Japanese system, that is described as ‘Rule-based’ planning system, which operates heavily with extensive zoning regulations and building standard regulations. The planning system in Japan and Tokyo in particular is based on rules and codes that are applied to each plot depending on the surrounding conditions of the site. The rules are expressed in ratios and proportions. One example is mixed function percentages. There is a possibility to change the classification of the plot; this is discussed with the office at the ward-municipal level, making the system flexible but also with a lower level of control. The Swedish system is based on an overall plan for the city and a detailed plan for each area which controls the outcomes of new constructions and changes. Permissions are needed to be able to develop the plot and planning is based on precise designs and placement of functions. This system can be seen as more rigid but with more control over public spaces. While both systems have advantages and disadvantages, the project will mainly focus on the adaptability and the changeability of built environments within those systems by understanding the mechanisms and the outcomes. The aim is to understand the perspectives on how we view the potentials regarding the densification and mixed-use in urban structure.The ‘Rule based‘ planning system is viewed as an abstract description of urban structure with potential values given to the plots, and that the abstract potential of individual plots reflect the bigger urban area, ie. FAR, BCR. Architecture styles and buildings of various functions occur within the potential values given, and the control comprises of controlling the values rather than the outcome of designs based on more specific programs. By finding a Swedish context for this kind of perspective change, the thesis tries to understand the potentials regarding densification and possibility of implementing the zoning categories that can be applied in Swedish urban typologies which will abstract the built urban fabric into values that are ultimately adaptable to changing urban conditions. Several different methods will be used, among others, working with Swedish detail plans and abstracting the drawings into the values and codes with which Japanese system determines its zoning categories. 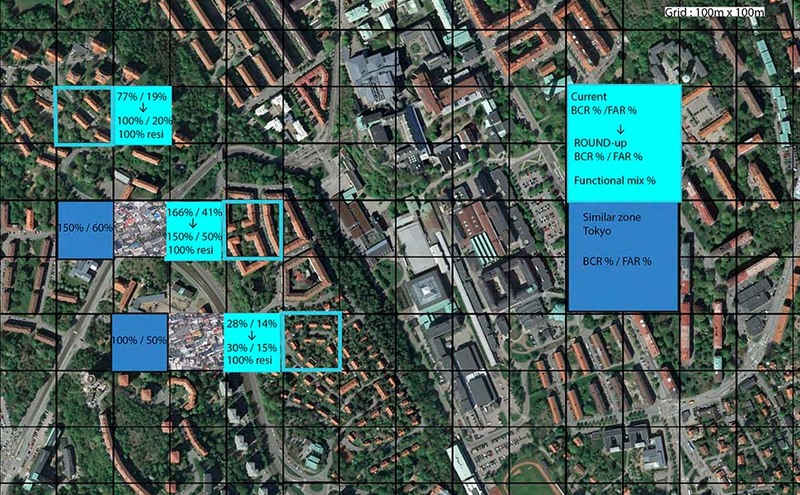 The parameters determining possible zoning categories in Swedish context will also be added. For instance, one such example is introducing noise level control that is particularly interesting in Swedish detail planning, rather than the shadow hour control that is more interesting in Japanese system. Also, Japanese New Towns that had adopted ‘Designed-form’ based planning system from the 1960’s-70’s will be studies and compared to the ‘Old Town’ areas of the same municipality which has continued to develop with ‘Rule-based’ planning system. The recent efforts and strategies implemented by the local government to regenerate and renew the New Towns will be examined as well. Outcomes - Developing Urbania v2. The outcome of this project will be preparation of web-based survey tool, Urbania v2, guidelines with methods and implementation criteria with ambitions to introduce a new perspective of viewing the urban structure and typologies, as well as public spaces and the use and availability of green spaces. Then the workshops using the tool, with diverse groups of planning agents will bring the perception gap on density and mixed-use matters between themselves and the reality, into discussion. The result of the workshop and the survey tool are also attempted as an efficient tool for communication between those involved in planning issues, such as developers and planners. This project page will soon stop being updated. Compact Cities Are Complex, Intense and Diverse but: Can We Design Such Emergent Urban Properties? 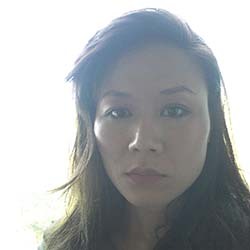 Hye Kyung Lim is a PhD candidate at Chalmers University of Technology, Department of Architecture in Gothenburg. She has previously worked as an architect in Tokyo, Japan.